“[…] Jaroussky weaves notes as fragile as the finest threads of spun glass. That still they shine vibrantly is purely due to Jaroussky’s delicate vitality, his moderately tasteful use of means of expression that he seems to have at his unlimited disposal. Just over two years ago, the Elbphilharmonie was inaugurated, and people believed that an angel was spreading his wings, protecting the new concert hall. At any rate, Philippe Jaroussky was celebrated as this heavenly messenger, who, high up above in the tiers and accompanied by the finely spun sounds by the harpist Margret Köll, seemed to immerse the hall in divine light. The performance remained engraved into many people’s minds and made the Frenchman who turned 41 this year become something like an unofficial figurehead of the new music temple. Later that same year, Jaroussky returned with the French Ensemble Artaserse to set Händel’s arias in the gold of his voice. 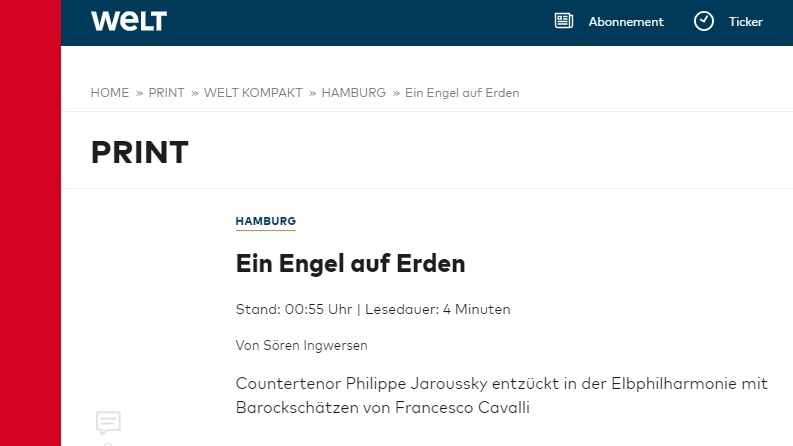 Once more, he now returns to the stage of the the great hall of the Elbphilharmonie with the 12 Baroque specialists – this time, to honor a master who was celebrated as a great opera composer during his lifetime, but who nowadays is hardly known: the Venetian Francesco Cavalli, pupil of the great Claudio Monteverdi, who invented the genre of opera in the early 17th century. Jaroussky and the Ensemble Artaserse open a musical treasure chest brimming with beguiling riches that night. The first sparkle that catches our eye right at the start is the aria “Ombra mai fu” from the opera “Il Xerse”, carried by great tranquility. Just as dedicated, as Jaroussky sinks into the worship of a tranquil nature, afterwards, in “Corone, ed Honori” from “Il Ciro,” he puts inner freedom of man in the balance of true values, contrasting it with courtly flashiness, while Raul Orellana and Jose Manuel Navarro energetically highlight the fiery confession with their violins, percussionist Michèle Claude lets the castanets pop, and Yoko Nakamura sets inciting accents at the cembalo. Immediately afterwards, Jaroussky presents the same character with the heart-gripping lament “Negatemi i respiri.” “Take away the air I breathe,” demands the desperate king, while Jaroussky’s voice, effortlessly spiraling upwards, never even has a hint of forcefulness, subordinating every tinge of rigor to a smoothly flowing line. A pleading chant that is reaching the very last rows, while never becoming obtrusive. Also in “Amor, ti giuro Amor” from “Erismena”, introduced by a highly dramatic recitative, one cannot help but marveling at the ease with which the singer tackles the ornaments and the well-controlled use of the vibrato which often only unfolds at the end of a sustained note, triggering oscillations that leave the antennas of the soul resonating in a sympathetic shiver at every second. In “Lucidissima face,” Jaroussky embarks on a completely different adventure. There, his flawlessly intonated soprano glides without resistance like on a shiny smooth surface. Before the inner eye, it reflects the moon that the words proceed to worship. In contrast, the funny, exuberant “Che città,” depicting the hustle and bustle of city life, with its bass lines of the viol at the start, and the rhythm of the drums, gives the impression of an early Baroque pop song. While Jaroussky is circling the musicians, establishing 360-degree contact with the audience, illustrating almost every syllable with a meaningful gesture, once more, the Ensemble Artaserse proves to be a first class accompaniment. Also in the interspersed instrumental pieces, the nine Sinfonias, it manages to connect sensitively balanced precision with brilliantly refined variety of sound, and a high level of articulation. Especially Adrien Mabire and Benôit Tainturier impress with their clearly intonated play on the cornet, a kind of wooden recorder-trumpet from the Renaissance period. Shortly before the break however, during the pain-stricken love aria “Uscitemi dal cor, lagrime amare,” almost all the instruments need to fall silent, while Jaroussky weaves notes as fragile as the finest threads of spun glass. That still they shine vibrantly is purely due to Jaroussky’s delicate vitality, his moderately tasteful use of means of expression that he seems to have at his unlimited disposal. In moments like this, the listener gets the impression that the hall was contracting, while at its centre of sound, the essence of human suffering crystallizes. Filled with inner drama, the aria “Misero, così va?” shines in incandescence, while the cornets highlight the sound of the ensemble like with flares, while in “All’armi mio core,” the music begins to gain dance-like momentum once more. The audience’s applause is rewarded with three encores, including an assertion of happiness by Cavalli, introduced by Jaroussky as “one of the shortest arias in the history of music”: a one-minute jubilation set to music. The musical bliss that night fortunately lasted longer: a generous 90 minutes.